Nick Libert has dedicated his entire adult career to empowering lives through real estate. 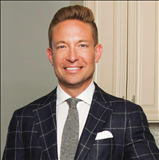 His passion for finding his clients the ideal home or investment property has manifested itself into rave reviews from many of his hundreds of past clients. His depth of nearly two decades of industry experience has made him a sought after sales coach, speaking in front of thousands of real estate agents & appearing on nearly every major TV network including multiple stints on HGTV staple House Hunters. Nick owns & operates EXIT Realty's #1 most productive office in America and is YOUR #1 source for trusted real estate information everywhere. Nick's learning-based philosophy led to undergraduate & law degrees (B.S,. 2000; J.D., 2004) from Valparaiso University, as well as the prestigious industry designations CIPS (Certified International Property Specialist) & CLHMS (Certified Luxury Home Marketing Specialist). Nick's personal real estate sales success lands him on the Chicago Association of Realtors Top Producer award list year after year, and for the past 6 years in a row he has been named a Five Star Real Estate Agent by Chicago Magazine. He is a Certified Mentor in the Brian Buffini Peak Producers program as well as a Level 3 student in the highly respected CORE program. Nick's vision has built him a loyal following large enough to propel his brokerage, EXIT Strategy Realty, into Inc. Magazine's list of 5000 Fastest Growing Privately Held Companies. EXIT Strategy Realty has its main office in Chicago as well as two satellite offices along Lake Michigan in Northwest Indiana & Southwest Michigan. He also has started a second company, Nick Libert Development, focused on revitalizing urban properties & beautifying neighborhoods. Based in part on these ventures, CS Magazine recently named him to their "Real Estate Visionaries" list for the 3rd year in a row. Nick is honored to be currently serving on the Board of Directors for the Chicago Association of Realtors as well as Illinois Realtors, and is always ready to engage new connections & mutual growth opportunities. "I am a first time home buyer and Nick was instrumental in helping me find my perfect home. I have a very type A personality and had many concerns ... more "
"As a first time home buyer Nick and his team made the experience amazing! Nick took the time to find me exactly what I was looking for in a home. I ... more "
"It was great working with Nick! He assisted me with all my concerns throughout the process of finding and purchasing the home we love. I would definitely recommend him to others."